LaMarcus Aldridge must hate Jazz music, because he destroyed the Jazz last night. I know some people might listen to it to put themselves to sleep, but LaMarcus clearly doesn’t understand the complex rhythms or appreciate the skill of the musicians, and LaMarcus must destroy what he does not understand. LaMarcus killed the Jazz last night, going 1-45-9-2-1-3-4 on 19-of-28 shooting and 6-for-8 from the line. Although the game went to OT, LMA has been killing it all year, posting top 20 value. Four quarters and overtime wasn’t enough for Aldridge, because after the game ended, he smashed some Thelonious Monk records and stomped on a picture of Dizzy Gillespie. On a more serious note, I could see Aldridge going in the second round next year, while you most likely got him in the fourth round this year. That’s value. There were ten games last night so many of your fantasy playoff fates were decided yesterday. This could have been the night that made your dreams come true, or shattered them to tiny pieces. Hopefully, for most of you it was the former…Anyway, let’s dive on in to the Friday Daily Notes! There are two points of a fantasy basketball season where seasons can be won and lost: the first is at the draft and the second is when there are about twenty games left in the season. The draft is obvious. That is when you set the foundation of your team. The second point is a little more subtle. For those owners in head-to-head leagues, this second point is important because you are setting your team up (hopefully) for the playoffs. You want players who have a lot of games and are on teams who will not be resting them during the critical time. The subtle part is directed more at owners in roto leagues. There are still enough games left to make moves in categories you can climb in or maintain your lead in categories you are ahead in. The waiver wire is your tool to win the league at this point. Young players are finally putting it together and playing well and injuries are opening up time for bench guys who have played well when given minutes. The Golden State Warriors, and their massive amount of injuries to star players, is a team to focus on in order to find one or two players who can help you with that late season charge. Welcome back, we were just waiting quietly for you. I hope you were able to add him. Cook is a 2-way player, no, that is not sexual. It means that he is one of two players each team can send back and forth to the G-League during the season. Cook has dominated G-League play for most of the year and now, because of injuries to Stephen Curry, Klay Thompson, and Kevin Durant, Cook is getting 40 minutes per game and putting up more than decent fantasy point guard stats. 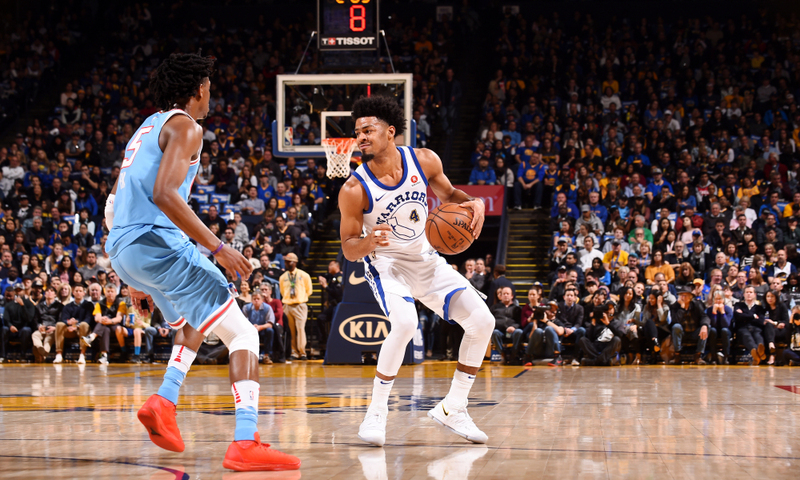 Last night Quinn Cook went for: 5/28/4/4/2/0 with only 2 turnovers in 40 minutes. This was on 11-17 shooting, including 5-7 from three. Pick him up. Man, the Warriors cannot catch a break… I mean, I don’t feel bad for their fans a bit, because they’ve been one of the most dominant teams in all of sports the last couple of years, but lately their luck has been running out. Kevin Durant will miss two weeks with an apparent rib injury he sustained against the Wolves back on March 11th. Obviously, this is a a heavy blow for his fantasy owners. You’re probably gonna have to stream heavy to win. Good luck is all I’ve got to say to you. Steph Curry is going to miss at least the next week and Klay Thompson is out for the foreseeable future. One of the main winners in this horrible situation is Quinn Cook. Last night, he went 5-25-4-3-3-0-1 on a scalding 10-of-13 shooting in 40 starter’s minutes. He’s probably worth the add with all the injuries to the Warriors if you want to gamble, but it’s relatively unknown what he’s capable of. One of the reasons I prefer fantasy basketball to fantasy football is that in basketball it is much less likely to have your entire season derailed by an injury. That being said, opening night of the 2017-18 NBA season twisted my world view right along with Gordon Hayward’s ankle. Ouch! It is when these things happen that I am reminded of two famous quotes: “Knowledge is power,” which I saw on a bumper sticker, and “Chaos is a ladder,” words spoken by the scheming Littlefinger in Season 1 of Game of Thrones. An injury can open the door for this year’s waiver wire MVP or at least offer a younger player an opportunity to get more minutes and become fantasy relevant. In order to take advantage you must not only act quickly, but you need to know which players will benefit the most, and that my friend is not easy.